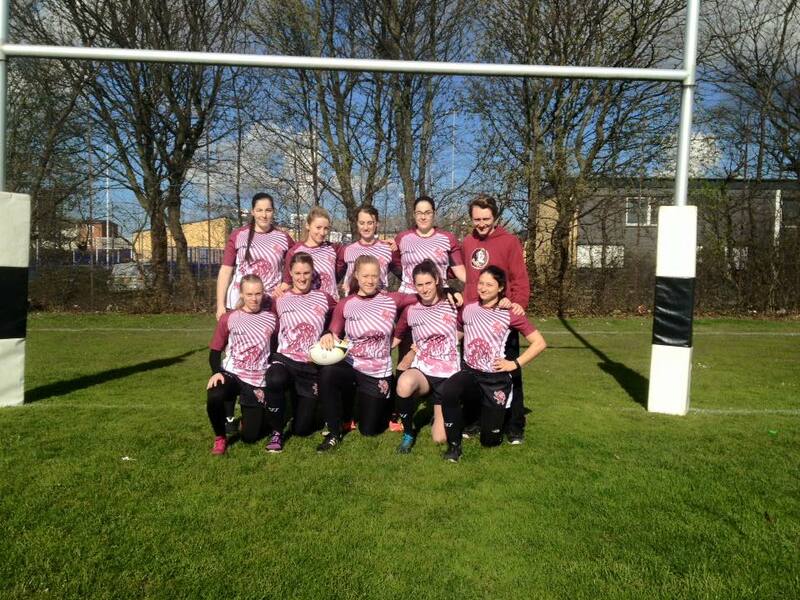 With a long pre-season behind them it was finally time for the ladies to take on the rugby season’s premier 7s competition, SM 2016. With the new format across the country splitting Sweden up into North, West and South regions for qualifying places into the SM finals, the Lugi ladies have been pitted against Pingvin, Malmö and Ronneby in a series of four qualifying rounds. Round one was to played in Trelleborg, home of the qualifiers number 1 ranked team, Pingvin, with Malmö ranked 2, Ronneby 3 and our ladies ranked 4th. With rankings based on various factors from last season, there was nothing for the ladies to be aggrieved about, but it certainly added a little more juice to the qualifier. Bottom Row: Sandra Olofsson, Martina Vivlund, Cornelia Nóren, Océane Chabrol, Elizabeth Sonnenholzner. The ladies first game came against the hosts, Pingvin, which would provide us with a good measuring stick for how we would fair on the day. The girls started off well and capitalised on Pingvin mistakes to get themselves close to the home team’s line before Elizabeth broke over from close range with some strong running. The advantage would not be held for long however, after poor tackling from the ensuing kick off allowed a line break and a offload to see Pingvin in under the posts. Unperturbed, the ladies hit right back following a fantastic break from Sandra Olofsson, who’s run was well supported by both Martina and Elizabeth, leading to her slightly wayward pass being collected and taken in by Sonnenholzner for the score. So far the story of the game had been about the porosity of the defence from both sides and Pingvin’s next possession didn’t break the trend, as following a lack of Lugi defensive pressure and a series of nice offloads, the home team went over yet again under the posts. The Lugi ladies were also first to strike in the second half, as a penalty move straight off of the training ground was perfectly executed and allowed Martina to finish off the try with some strong running. Once again though, the positives for Lugi were evened out with a lack of defensive execution as Pingvin hit straight back, getting around the edge of the Lugi defence to score the last and decisive try of the game. The end result was an even game of three trys apiece, but decided by just one kick. Following the game, the whole team was very pleased with their performance and the loss felt more like a win, having put on some good rugby and started strong. Our weakness in defence was identified and the team resolved to improve on it going forward. 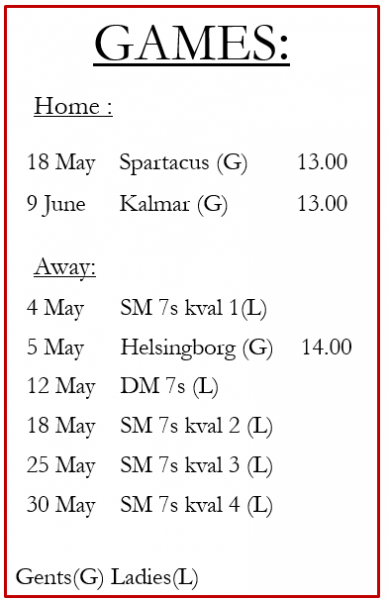 Following their strong performance at Håckes Cup, our local rivals Malmö were always going to be strong contenders in the Southern qualifying pool. This contest opened up a lot tougher and tighter than our first game, with our tackling up to the expected standard and Malmö matching us. The ladies defensive pressure, which was so lacking in the first game, was the key to the opening score in game 2, as our defence smothered Malmös backs near their own line, eventually causing a turnover through a fumbled ball and Olofsson being quick to gather and score. Malmö then enjoyed a good spell of possession, albeit deep in their own half, keeping the ball tight around the ruck and working the blind before finally getting the ball wide to their speedster, who was able to get on the outside of our defence to get over the line for the score. Despite the disappointment of allowing their key player on our outside, the defensive chase to deny an easy two point conversion was an exemplary note of the team effort and work that has been developed over recent seasons. In previous seasons, the ladies play has been marred by drops in confidence and an inability to respond following opposition scores. Therefore, on of the day’s big positives was the team’s ability to stick to the gameplay and play the full 14 minutes as if it was 0-0. Following Malmös score, our ladies were able to hit back with aplomb after Olofsson made a great break after a scrum won against the head, and took us deep into Malmö territory. The score was finished off by the day’s Player’s Player, Meliha, who spotted the space blind off the ensuing breakdown and ran down the line to take Lugi ahead 10-5. From there the game evened up, with both teams enjoying a fair amount of possession and having attacking phases quashed by a mixture of good defence and errors. With a game that could have gone either way with only a single try in it, it was Lugi that finished the game off after Malmö gave away a penalty on their own 22, allowing Sonnenholzner to execute a near perfect chip and chase and see herself over the line on the last play. The ladies final pool game came against a team that has slowly been on the rise in the south, and who are no longer to be taken lightly following a series of good results in recent tournaments. A win in this final pool game would give our girls a shot in the qualifier final against Pingvin. After a spluttering start to the game from both teams, Lugi’s defensive pressure once again earned them a score, this time for Ronneby native Cornelia, who scooped up a Sonnenholzner offload to cross the whitewash. The following muffed kick-off and swarming Lugi defence allowed Elizabeth to get a score of her own and go under the posts following a nice step. With Ronneby looking a little deflated and following a series of mistakes near their own line, Martina was able to crash over for score number three following a close range penalty and a slick offload out the back from Sonnenholzner. With the Lion’s tails up in the second half the play started to really flow and the girls once again got rewarded for their willingness to work in support of one another in the form of multiple offloads going to hand down the right flank before the ball finally landed into the arms of Vivlund on the wing, who tip-toed her way down the line for another score. The final high note of the game came from our flying French winger Océane, who found herself rewarded for her excellent support during the whole day as she finished off nicely following some slick hands and offload off a Ronneby turnover. The remainder of the game served as a warning for the team, as attacking shape began to be lost and the girls fought a lot of their battles around the breakdown instead of out wide, leading to a scrappy finally quarter. 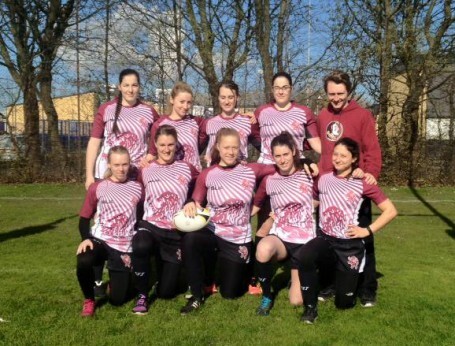 Nonetheless, the ladies had deservedly put themselves through to the final and were happy with the rugby they had produced and their smothering defensive effort. Having secured themselves a place in the final, the Lugi Lions found themselves up against the team that had seen them off in the day’s opening game. The ladies confidence in themselves and their rugby had been building throughout the day and they were ready to take on the home team and the crowd in what promised to be an interesting encounter. Similar to game one, the ladies got off to a flyer as following a scrum in our own half, Martina was able to take advantage of a slip in Pingvin’s midfield to go 80 meters untouched for the score. If ever there was an omen that this was the ladies final to take, it came on the ensuing conversion attempt as Martina’s conversion received a solid helping hand from the crossbar to get the ball over and take Lugi 7-0 in the lead. Despite the good fortune, things got wobbly in the following minutes for Lugi as Pingvin pressure and a lack of handling execution saw the girls pushed back from the opposition’s 22 to nearly conceding at their own end on multiple occasions, saved only by some last ditch tackling and Pingvin handling errors. It was said handling errors that allowed Lugi to get the opening score of the second half, as good awareness and work on the ground from Meliha allowed Martina to take advantage of an open blindside to run in for the score and take us to 14-0. With the minutes beginning to tick away, Pingvin started to exert some pressure on the Lugi line following a well placed clearance kick. Eventually this pressure from the white and black of the home team saw them over in the corner following a blindside move from an attacking scrum, clawing the score back to 14-5. With only a minute left in the game, the hammer blow was delivered by Lugi following some mazy running by Mehmeti off the kick-off softened up the defence enough for Cornelia to put on a nice step and strong run to break the Pingvin line, before showing a clean pair of heels for the score. With the score standing at 21-5, the game was dead and buried and our girls rightly celebrated an excellent qualifier win! Following a very successful day, the team was quite rightly overjoyed and thoroughly pleased with some of the rugby that was produced, but realised that there are plenty of aspects of their game that can be improved on and more hard work needs to be put in to up their game before the next round, which is sure to prove even more competitive. More than anything it showed the team the rewards that can be reaped from hard work and dedication on the training field and has given them a long awaited qualifier win. Finally, a big thank you should be given to Pingvin for an impeccably run qualifier and all the teams involved for a great day of competitive games. 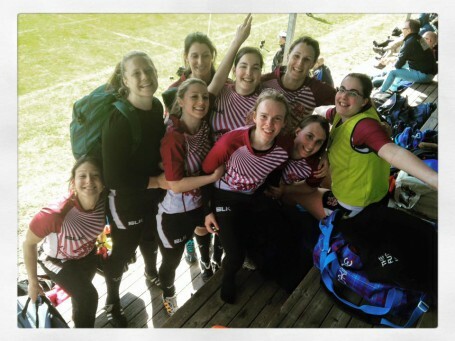 This entry was posted in Match Report, News, Women's Team and tagged Lugi, lund, Malmö, Pingvin, qualifier, Roneby, rugby, rugby sevens, sevens, SM, SM 2016, trelleborg, try, winners, world rugby on April 24, 2016 by Ross.